When you do what you love doing success follows naturally. You feel good about yourself and it becomes easy to do what you need to do to achieve your goal. This is important because doing what does not come naturally causes stress. It is only when you use your natural skills and abilities that you feel relaxed and can enjoy what you are doing. You can prosper, enjoy loving relationships and feel happy – all it takes is to be doing what you love to do. Whether you want to build an employed career or to work for yourself, the first secret of success is to love what you do. Love is one of the most powerful human feelings. It is probably the most powerful of the positive human emotions. When you feel love you are powerfully attracted to the object of your love. You are full of energy and determination. Love focusses your attention and fills you with the desire to make things happen. When you’re in love with what you do you become completely fixated on the object of your love and filled with the energy to make it happen. You become a human being with a mission. Those who have a powerful vision and massive energy are the ones who succeed and find meaning in their lives. You can either spend a lot of time observing yourself during your daily activities and noticing the highlight moments. This is hard to do because you are living through an ongoing event and many other things will distract you. You can sit with a pencil and paper bringing to mind and writing down the occasions when you felt especially good. You will find lots of tips on how to do this in the Amazon book Create The Life You Want. You can do the same exercise with a friend, helping each other. Most people who try this find that it is very easy to become distracted and to not take the exercise seriously. You can attend a workshop where you will be led through the process by an experienced life coach who has helped hundreds of other people. Here your search for meaningful moments will be much wider to make sure you do not miss anything. Then your choices of what you love doing will be rigorously tested. By the end of the day you will be clear about what you love to do – Discover Your Passion 1-Day Workshop. Of course, you can simply go on doing what you are going now, in which case nothing in your life will change. 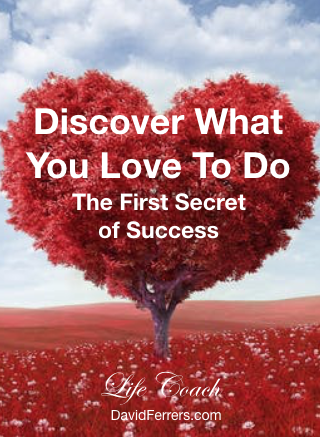 Or, you can discover what you love to do and find success and fulfilment. The choice is yours, you can go on feeling stressed and frustrated or you can act now! What is the best way to develop a success mindset?